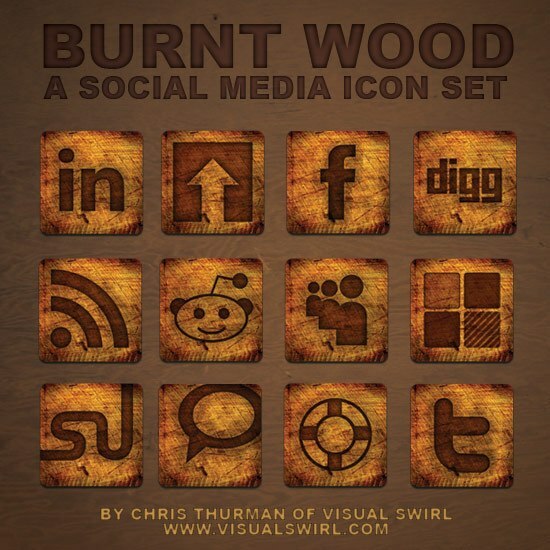 Burnt Wood is a collection of wood-tiled icons branded with various social media network logos that are perfect for your next grunge-styled web design. The package contains 12 icons for many of the popular social sharing sites. Each icon is a 420x420px PNG file that can be scaled down to any size needed. This set was designed by Chris Thurman of Visual Swirl exclusively for the readers of Six Revisions. It was inspired by a burnt wood text effect tutorial and created entirely in Photoshop. The set can be used for any private or commercial project for free without restrictions. The set may not be resold, sub-licensed, rented, transferred or otherwise made available for use. Please link to this post if you would like to share this set. WebFX in Harrisburg, PA is a full-service internet marketing agency. They have an on-site team that specializes in social media marketing. Check out the benefits social media can provide your business here and inquire about industry-specific social media tactics today! Here are some social media tips they put together for an electrician’s business!